•Application in combination with water-injected exhaust systems only. •All parts are made of synthetic materials (no corrosion). •Tremendous reduction of exhaust noise. •Back pressure is absolutely minimal. •Stainless steel mounting brackets for the muffler are standard supply. 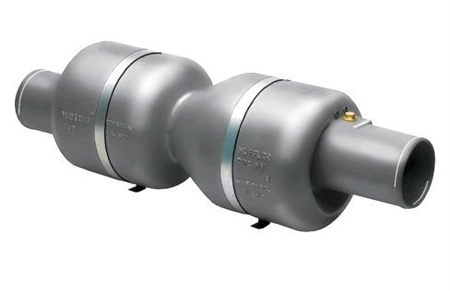 •For muffler model MV a temperature sensor for a raw water alarm is optional and can be supplied with the muffler. The muffler and the transom connection of this exhaust system may only be installed when the transom connection is positioned at least 5 cm lower than the outlet of the engine’s exhaust manifold, in which case the flow of the seawater, injected into the exhaust bend, will always be directed away from engine. Both the muffler and the transom connection are provided with a check valve (”flapper”), which ensures that under no circumstances (e.g. when in waves or manoeuvring astern) can the seawater flow towards the engine. Therefore, this system makes the installation of a gooseneck unnecessary.